Craig Renkert and his wife Barb planned a three-week tour of Southeast Alaska for this summer. They were looking forward to ferrying through the Inside Passage, celebrating the Fourth of July in Sitka and staying at bed-and-breakfasts along the way. Then, the couple from Ohio got some bad news. “When I got the email last Friday, I was very frustrated in that here they were, at the last minute, changing the ferry schedule. Because many of those places I made reservations have 60-day cancellation policies. Now, the trip is less than 60 days away. Renkert spoke with a reservations agent and was able to change his itinerary, though he’s still juggling shore-side details. He’d heard of ferry breakdowns and spending cuts affecting the schedule. But the agent didn’t give a reason for the change while rebooking. “Just because the budget wasn’t planned further in advance seems to be utterly inconsiderate of the locals in the communities, their businesses and the tourists,” he says. Legislative budget cuts were expected to deeply reduce sailings this summer, especially in Southeast. Officials estimated the reductions would cancel reservations already booked by about 10,000 people. But the Walker administration was able to shift $5.5 million in unused money from this year’s fuel fund to next year’s operating budget. Alaska Marine Highway System spokesman Jeremy Woodrow says that allows other ferries to go ahead with scheduled service. “The only ship that will be [affected] will be the Taku coming out. The other ships will be sailing as scheduled,” he says. 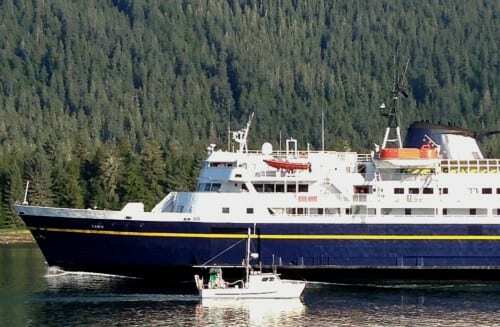 With the Taku out, sailings to and from Prince Rupert, British Columbia, will be cut from four to two a week. Those sailings also stop in Ketchikan, Wrangell, Petersburg, Sitka, Kake and Juneau. Before July, the Taku is filling in on routes of other ferries that need extra time for repairs. Woodrow says the ship’s time off will be used, in part, for work that’s been delayed. “Every ship is required to have an overhaul, which is where we do an inspection to make sure it gets its recertification so it’s safe for passenger service. So you have to do that annually. You can’t push it back several months,” he says. He says reservations staffers are contacting those who booked travel on the Taku beginning in July. Democratic Juneau Sen. Dennis Egan says cuts leading to the ship’s cancellation show bad budgeting by the Legislature’s Republican majority. He says Alaskans make up almost a third of those sailing Taku routes. And visitors contribute revenue to the ferry system and port-city businesses. “The ferry system is the highway for Southeast and coastal Alaska and passenger and vehicle fees are its lifeblood. Because we lack a completed budget, this decision will cost the State of Alaska more than $400,000 of revenue,” he says, in a press release. Majority budget-writers have said the ferry system is too expensive and something the state cannot afford to maintain at its current service levels. Renkert, who lived in Anchorage for 18 years, just got a second notice of cancelled reservations and a new itinerary. “I’m spending my money with local B&Bs, not with cruise ships, because I want a local experience. If it’s not available that’s going to make it much more difficult for me to do this trip again in the future and make it difficult for me to recommend it to others,” he says. His trip is the sort promoted by the ferry system and port communities. While most of the summer schedule will remain intact, other reductions are likely come October, the start of the winter schedule.